What shall I render unto the LORD for all his benefits toward me? I will take the cup of salvation, and call upon the name of the LORD. I will pay my vows unto the LORD now in the presence of all his people. Precious in the sight of the LORD is the death of his saints. O LORD, truly I am thy servant; I am thy servant, and the son of thine handmaid: thou hast loosed my bonds. I will offer to thee the sacrifice of thanksgiving, and will call upon the name of the LORD. I will pay my vows unto the LORD now in the presence of all his people, In the courts of the LORD’S house, in the midst of thee, O Jerusalem. Praise ye the LORD. You who listen on the radio with us here in the First Baptist Church in Dallas, let us read this beautiful text together, Psalm 116; Psalm 116, beginning at verse 12 and reading to the end of the psalm. One of the most beautifully meaningful in all the Psaltery: the one hundred sixteenth Psalm, beginning at verse 12. This is the pastor bringing the message entitled With Thanksgiving to God. Now let us read it out loud, all of us together. What shall I render unto the Lord for all His benefits toward me? I will take the cup of salvation, and call upon the name of the Lord. I will pay my vows unto the Lord now in the presence of all His people. Precious in the sight of the Lord is the death of His saints. O Lord, truly I am Thy servant; I am Thy servant, and the son of Thine handmaid: Thou has loosed my bonds. I will offer to Thee the sacrifice of thanksgiving, and will call upon the name of the Lord. I will pay my vows unto the Lord now in the presence of all His people, In the courts of the Lord’s house, in the midst of thee, O Jerusalem. Praise ye the Lord. That is the text, and the message this morning is a presentation of it, verse by verse, With Thanksgiving to God. “What shall I render unto the Lord for all His benefits toward me?” [Psalm 116:12]. It is a question, worshipful, rightly asked. It is a holy benediction; it blesses the heart just to think of it and to ask it. “What shall I render unto the Lord for all His benefits toward me?” As it is right for a man to render to Caesar the things that are Caesar’s, so it is pious and holy that we render to God the things that are God’s [Matthew 22:21]. “What shall I render unto the Lord for all His benefits toward me?” [Psalm 116:12]. We shall not forget one of them, “for all His benefits toward me.” As in a beautiful music composition, if one note is left out, the melody is ruined, so with us, as we enumerate our mercies from heaven, we would not leave one of them out. “For all His benefits toward me”: my life, the frame in which God hath placed my spirit, with eyes to see, and ears to hear, and hands to use, and feet to walk, and heart and mind to feel and to know, and the protecting care that blesses us every day. And my soul’s salvation in the goodness and mercy of Jesus, and the promises writ large in His Book of an upper and a better world that is yet to come. Ah, the benefits multitudinous of the Lord toward me! What shall I render unto God for these mercies? First, he says, “I will take the cup of salvation” [Psalm 116:13]. Now that returns to a habit in Israel when some great blessing or deliverance came to them from God. The priest or the elder in the family would lift up a cup and lifting it up would speak of the goodness of God, the deliverances of the Lord, the blessings of heaven. Then they would drink from that cup as a sign of their gratitude and thanksgiving to God, “I will take the cup of salvation.” It’s the same kind of a thing exactly that Jesus did in the institution of the Lord’s Supper. He lifted up the cup and said, “This is the cup of salvation, My blood for the remission of sins; all of you drink of it” [Matthew 26:27-28]. Or as Paul wrote in the tenth chapter of 1 Corinthians, the cup which we bless, is it not the koinōnia of the blood, the love, the sacrifice, the grace, the mercies of Jesus [1 Corinthians 10:16]. “I will take the cup of salvation” [Psalm 116:13]. Now isn’t that an unusual thing? Because you haven’t followed it closely, look at it. “What shall I return to the Lord for all His benefits toward me?” [Psalm 116:12]. Now wouldn’t you have thought that the psalmist would have said, “I will bring Him so and so, or I will give Him so and so, or I will dedicate to Him thus and so.” Wouldn’t you have thought that? But what an astonishing thing when he writes, “What shall I return unto the Lord for all His benefits towards me? I will take,” just the opposite of what you would think, “I will take the cup of salvation from His gracious hands” [Psalm 116:13]. Now isn’t that an amazing thing, but how true spiritually. We glorify God when we receive His love and His blessings. And we dishonor our Lord when we refuse them. What shall I render unto God for all His goodneses toward me? I will take from His blessed hands, these mercies, and these benedictions, and the loving remembrance of God in Christ Jesus. I will take from His hands these blessings. And we may receive them to the full. I heard one time of a little starved, emaciated child who was brought to a charity hospital, and in the morning a nurse brought to the little starving-creature a full glass of milk and placed it into the hands of the little boy and said, “drink it. It is yours, drink it.” And the little boy began to drink, then he stopped, and he asked the nurse a question that revealed a thousand things in his little life. As he began to drink, he stopped, and looking up into the face of the nurse, he asked, “How deep may I drink?” For in his starving family, a glass of milk had to be shared by so many children, and each one could drink just so much. And when the child asked the question, “How deep may I drink?” the nurse replied, “Son, drink to the full, drink all of it.” That’s God’s goodnesses to us. The full measure of His blessings, receive them all. We glorify God in taking them from His gracious hands. “What shall I render unto the Lord for all His benefits toward me? I will take the cup of salvation” [Psalm 116:12-13]. Then they that feared the Lord spake often one to another: and the Lord hearkened, and heard it, and caused a book of remembrance to be written before Him for them that feared the Lord, and that thought upon His name. And they shall be Mine, saith the Lord of hosts, in that day when I make up Mine jewels; and I will spare them, as a father spareth his own son that loveth him. Think of that. “What shall I render unto the Lord for all His benefits toward me? I will take the cup of salvation to the full, and I will call upon His name” [Psalm 116:12-13]. Third: “I will pay my vows unto the Lord now in the presence of all His people” [Psalm 116:14]. I will pay my vows unto the Lord now, this day, this hour, in the presence of all His people. There’s not one of us but that has experienced that, every one of us. There are times in our lives when we have promised to God, and spoken to God, and avowed to the Lord the dedication of our lives to Him. Maybe it was in a time of distress and trouble, maybe it was at a time of infirmity and illness, maybe it was at a time of great dedication and moving commitment, but there’s not a one of us among you young people, among fathers and mothers, families and homes, there’s not a one of us but has experienced that. We have avowed unto God the dedication of our lives to Him. “What shall I render unto the Lord for all His benefits toward me?” I will be true; I will reaffirm and recommit myself to that vow. “I will pay my vows now in the presence of all of God’s people” [Psalm 116:14]. Then that reminds him of something. For this psalm, most apparently is one written after some marvelous deliverance from God’s hands. And it reminds him that, in the public commitment of God’s people to the Lord, some of them therein and thereby lay down their lives. For the verse that immediately follows says “Precious in the sight of the Lord is the death of all His saints” [Psalm 116:15]. Well, you’d say that’s a strange thing to put together there, “I will pay my vows unto the Lord now in the presence of all His people. Precious in the sight of the Lord is the death of all His saints” [Psalm 116:14-15]. It has nothing to do, oh, yes it does, yes it does! Now I did not invent this Bible, and I don’t originate this message I deliver, I’m just a voice, just an echo. I just read what it is God has written here in the Book, and I try to speak it the best I can. Now, I did not invent this, but this is God and God’s unfailing and unswerving revelation of His will for us, and that is that there be an open and public and unashamed dedication of our lives to the Lord, publicly. “I will pay my vows now in the presence of all His people” [Psalm 116:14]. There is no such thing as a clandestine, furtive, ashamed secret follower of the Lord. No, “Whosoever is ashamed of Me and of My words in this evil and adulterous generation; of him shall the Son of Man be ashamed, when He comes in the glory of His Father with His holy angels [Mark 8:38]. If thou shalt confess Me before men, him will I confess before My Father in heaven [Matthew 10:32]. That’s God. I am to make my avowal and my commitment to God open and public [Psalm 116:14]. Why didn’t Daniel close his windows when he prayed? In that way, he could have escaped the judgment of the enemies in that Median Persian court. But he opened his windows three times daily toward Jerusalem and called on the name of the Lord [Daniel 6:10]. 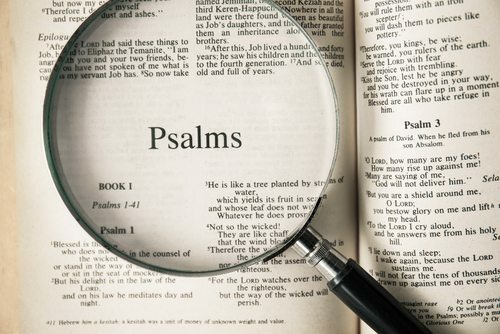 It is a public avowal, it is a public commitment, and that reminded him that in the dedication of some of his people who had defended the Lord, maybe had fought in battle for Jehovah, they had laid down their lives, and he says, “Precious in the sight of the Lord is the death of His saints” [Psalm 116:15]. Well, sweet and precious and dear people, that’s one of the dearest verses in God’s Book. I suppose I’m ten times sensitive to it because of the funeral services that I conduct. “Precious in the sight of the Lord is the death of His saints.” God marks it, and God sees it, and God knows it. It’s not hidden from Him. As a sparrow cannot fall to the ground without our heavenly Father [Matthew 10:29], so one of the least of God’s saints cannot die and it not be precious, dear, noted in His sight [Psalm 116:15]. He is there; God is there, and He makes smooth the pillow, and He receives the soul [Acts 7:59; 2 Corinthians 5:8]. Oh love of God, how rich and pure! The saints and angels song. Imagine an inmate in a cell in an asylum writing that. “Precious in the sight of the Lord is the death of His saints” [Psalm 116:15], wherever one has fallen, God marks. For example, in the second chapter of the Book of Revelation, it says that in Pergamos, where Satan has his throne, God says My faithful martyr Antipas laid down his life [Revelation 2:13]. Who is that? Nobody ever heard of him, nobody knows of him, nor does anybody ever know anybody who ever knew Antipas, but God noted it, and God wrote it down. My faithful martyr Antipas, “Precious in the sight of the Lord is the death of His saints.” And isn’t that an unusual way to say it? When God made the creation [Genesis 1:1-30], He looked at everything that He made, and behold it was very good [Genesis 1:31]. But it never says, as God looked at the work of His hands, it never says in the Bible, and behold it was precious in His sight. Well, why should death and the death of God’s people, why should death be called precious in His sight when death is a wastrel and destroys what God has done. “Precious in the sight of the Lord is the death of His saints” [Psalm 116:15]. Why? Well, there are several things to be said of that. One, one: it was in death that Christ turned defeat into victory. My brethren, flesh and blood can not inherit the kingdom of God; neither doth corruption inherit incorruption, but I show you a mystery; We shall not all sleep, but we shall all be changed. In a moment, in the twinkling of an eye, at the last trump: for the trumpet shall sound, and the dead in Christ shall be raised incorruptible, and we shall all be changed. For this corruption must put on incorruption, and this mortality must put on immortality . . . then shall be brought to pass the saying that is written. Death is swallowed up in victory. O Death, where is thy sting? O Grave where is thy victory? . . . Thanks be unto God, who giveth us the victory through our Lord Jesus Christ. That’s the first reason. “Precious in the sight of the Lord is the death of His saints.” This is the great battleground that brought Christ’s greatest trophy of grace, His victory over death. Second, “Precious in the sight of the Lord is the death of His saints” [Psalm 116:15]: this is the occasion of the great witness of the martyrs of Jesus. Think of their words; Stephen, as he lay his life down, beneath the hail of stones, lifting up his face, and seeing the Lord at the right hand of Majesty [Acts 7:55-56], and praying, “Lord Jesus, receive my spirit” [Acts 7:59]. Think of the witness of the saints of God through the centuries: Peter and Paul, Savonarola, Huss and Hubmaier, Latimer, and these modern day saints of God who die in these bitter and merciless communist lands. “Precious in the sight of the Lord is the death of His saints” [Psalm 116:15]. And again, herein shall be the occasion and the ground for God’s greatest coming victory, when this earth and the very heavens have passed away, and when the monuments of men have crumbled down into dust, God shall raise us up, we who have fallen asleep in Jesus, to live and to reign with Him forever and forever [1 Thessalonians 4:13-17]. “I will pay my vows unto the Lord in the presence of His people” [Psalm 116:14], which reminds him of us, who shall someday lay down our lives, and he says “Precious in the sight of the Lord is the death of His saints” [Psalm 116:15]. “What shall I render unto the Lord for all His benefits toward me? I will take the cup of salvation and drink it to the full. I shall call upon His name; I shall pay my vows, the dedications I have made to Jesus in the presence of all of His people” [Psalm 116:12-14]. Fourth, last: “I will offer to Thee the sacrifice of thanksgiving.” “I will offer to Thee the sacrifice of thanksgiving” [Psalm 116:17]. Now to offer to God the blood of bulls and goats, I am sure in the old covenant was precious in His sight. But today, as the author of Hebrews says, “By Him therefore let us offer the sacrifice of praise to God continually, that is, the fruit of our lips giving thanks to His name” [Hebrews 13:15]. How do we sacrifice to the blessed Lord today? We do it with our praises and with our thanksgivings and with our joys to God. A beat up, beat down, defeated Christian is an anomaly! He’s a dilemma in himself, he’s a funny hybrid. “What shall I render unto God for all His benefits to me?” I shall offer Him the sacrifice of praise and thanksgiving [Psalm 116:12, 17]. Lord, blessed be Thy name for the wonderful goodnesses where by Thou hast remembered me. As most of you know, for a good many years, I was president of the Sunday School Board of our Southern Baptist Convention. And over there one time in a meeting in Nashville, the business administrator of the Sunday School Board, his name was R. L. Middleton, he wrote a little book, and he put this in his book. Over there at one of our meetings, this businessman—he’s not a preacher, he’s a businessman—this business administrator told an incident that happened at a testimony meeting. It was this. He said that there was a construction worker in the days of the Depression by the name of Clarence Powell, and the construction worker had six little children. But he was a worker only when he could find work, for those were heavy, heavy days. And the family lived next to starvation. The time came for school, and three of those children needed shoes, they had worn them out. And that was much against the delight of the father because those rough boys would use their shoes to brake their scooters and to drag them on the concrete and on the sidewalk. And his little girl wore out her shoes skipping a rope out there on the sidewalk. And they had to have three pair of shoes, for those three pairs were worn out. And as he was trying to think how he’d find enough money to replace those worn-out shoes, why, his wife came in and said that their washing machine had hopelessly broken down and was not repairable. So he looked through the ads to find somebody who was advertising a secondhand washing machine and found an address, cut it out of the newspaper, went to the place, and there was a most imposing house, beautiful grounds. And as he looked at it, he resented it. Some people have all the bricks, they have everything, and he’s nearly starving to death with his wife and six little children. Well, he walked up and rang the door bell, and he was graciously entreated, invited in, and he told them what was the matter—the washing machine, the wife, six little children, no money, and they had to do something, so he read they had a secondhand washing machine for sale, and he had come to inquire. Well, that construction worker said, “I went home, and I got out those three pair of worn-out shoes, and I laid them before God, and I thanked God for them,” for three pairs of worn-out shoes. “What shall I render unto the Lord for all His benefits toward…I will offer to God the sacrifice of thanksgiving” [Psalm 116:12, 17]. Man, you don’t know how much you are blessed. Let me read it to you. Here’s a little poem entitled, “The World is Mine.” It’s written by a woman. And as she passed—she smiled. I have two legs—the world is mine. If I were late would do no harm. “I thank you, you have been so kind. I have two eyes—the world is mine. And then I knew, he could not hear. I have feet to walk where I would go. I am blessed indeed—the world is mine. “What shall I render unto the Lord for all His benefits towards me? I will offer Him the sacrifice of thanksgiving” [Psalm 116:12, 17]. Bless God, bless God, He has been so good to me. And if He has been good to you, maybe you want to tell Him about it in the presence of all His people. And while we sing our song of appeal, to give your heart to Jesus, or to put your life in the fellowship of the church, while we sing this song, you come and stand by me. This morning, this hour, this precious moment, make it now, come now, while we stand and while we sing.